Even in ancient times writing had to be learned. But then people did not use pen and paper, but e.g. 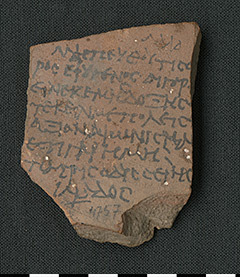 a potsherd (now called ostracon) and a kalamos, as can be seen in this example of an ostracon from a red-colored jar, which was inscribed with a poem about the origin of Homer. Homer is probably the most famous poet of antiquity. The two works attributed to him, the Iliad and the Odyssey, are among the best known books of the world literature. His creative period was either in the second half of the 8th century BC or the first half of the 7th century BC, but further details about his life, his origin or his birth and death dates are unknown. Homer is silent about himself in his works. Therefore, people already discussed the person and the origin of this poet. Many cities claimed to be considered this birthplace. In many texts the origin of Homer is treated but already in antiquity people admitted that the truth about the origin of this great poet cannot be found out. The text of our ostracon also deals with the origin of Homer. Based on the handwriting it can be assumed that the potsherd was inscribed in the 2nd century BC. A few letters are missing on the right side because the potsherd is broken. Nevertheless, the content of this short poem (epigram) is comprehensible. The text starts with a warning. There it says: “Do not ask where I, Homeros, come from.” The birthplace of Homer should, therefore, not be revealed. Instead, this introduction cleverly prepares, what the poet, who appears as the speaker in this poem, has to say about his true home. First, however, the cities which claim to be the birthplace of Homer are accused of lying. And, they are also accused of having made this claim in order to share in the poet’s fame. In the end, however, Homer reveals that the real home of a poet is his work. The person of the poet is less important than the Iliad and Odyssey with which he has created a monument for eternity. Thus, the question of the true birthplace of the poet becomes unimportant. In addition to the content it is also interesting that this text has a short headline. It was added later in the tiny free space above the first line. While it does not say anything about the content of the poem, it probably refers to another epigram of the same topic which is related to the text preserved here. Perhaps we can assume that at the same place there was another ostracon with another epigram about the origin of Homer. This entry was posted in Object of the Month. Bookmark the permalink.